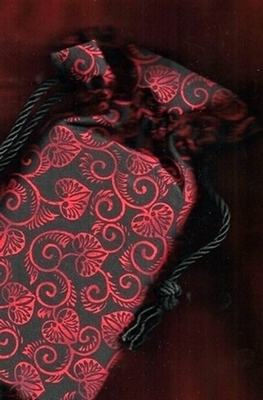 Double Draw Tarot Bags - Secrets Double Draw Tarot Bag - Tarot Bags, Tarot Cards, Cloths, & More! Scarlet red vines curl in and out, weaving intrigue and mystery against a deep black background. The leaves and stem intertwine like the secrets that entangle our lives, embellished with little flourishes and decorations. The word arcana (singular arcanum) refers to secret, hidden things, and the Major and Minor Arcana of the Tarot seek to teach us the deeper mysteries, or secrets, of life.